*I know, things have been quiet on the blog-front. But that only reflects how busy we are foraging, farming and spending lots of time outside! Blue Bramble Farm is expanding and we are doing plenty of workshops for individuals and groups these days. Still loving this work! Eat ripe mulberries fresh or cooked in a variety of dishes. In a good, rainy year, collecting buckets full of mulberries for smoothies and pancakes is easy and can be done in record time. But before collecting, be sure the berries taste good. Like all plants, wild berries reflect their growing environment and vary in taste and sweetness based on the soil type, moisture levels, weather and other factors that influence their growth. Some berries won’t be as sweet as others but all are high in Vitamin C and essential minerals. Mulberry trees are small to medium-sized and can grow over 50 feet tall though they sometimes resemble a large bush. 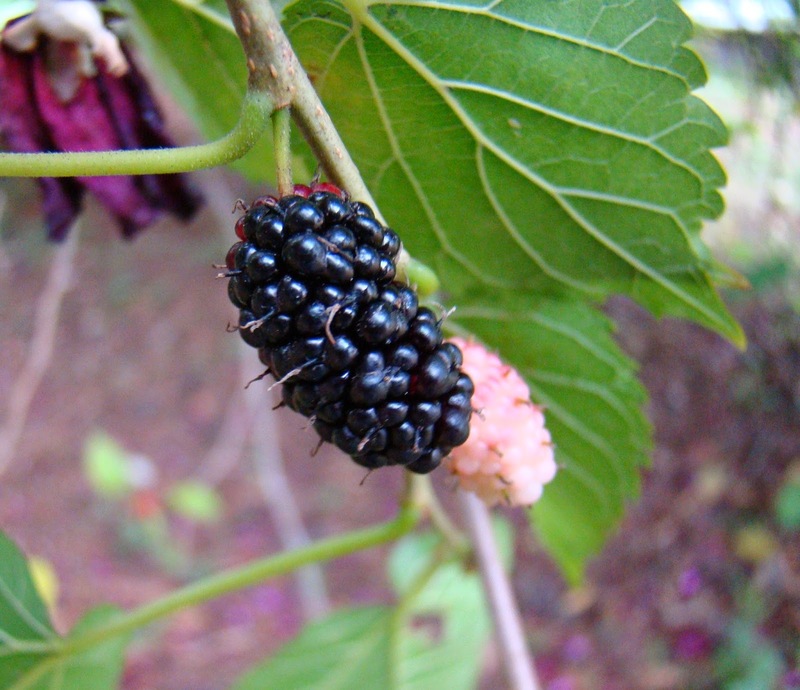 In Texas, the most common mulberries include the Red Mulberry (Morus rubra) which is usually found in deeper soil, and the Texas Mulberry (Morus microphylla), commonly found in the western half of the state. Both have edible fruit that ripens to a dark, purplish-black color and resembles long, thin blackberries. The White Mulberry (Morus alba) is not native to Texas but does occur in our state and has varieties that ripen to white, red or purple. Also, the paper mulberry (Broussonetia papyrifera) is a distant relative and does not have edible fruit. Mulberry leaves alternate along the stems and appear highly variable from tree to tree or even on leaves from the same tree. They are generally shiny on the top and are heart-shaped, ovate or lobed like mittens with serrated edges. Mulberries are easy to harvest by simply plucking the ripe berries from the tree. They ripen randomly over several weeks from April to early June. Mulberries can be eaten fresh, even with the tiny green stem attached, or they can be frozen for later use. Like most berries, mulberries can be used to create delicious smoothies, sauces, pies, jams, juices and mixed drinks. They will remain fresh for a couple of days in the refrigerator or can be frozen for up to a year. A little bit of mulberry sorbet on a hot Texas afternoon is perfectly sweet and refreshing! Prepare the syrup by adding 1 cup of sugar and 1 cup of water to a saucepan. Bring to a boil, stirring frequently until the sugar dissolves. Remove from heat and let cool. Puree the mulberries and lemon juice in a blender or food processor. Stir in syrup and pour into a metal pan and freeze. When mixture is frozen, remove from pan and blend in food processor or blender. Scoop into airtight dish and refreeze. Serve with a few ripe mulberries sprinkled on top. 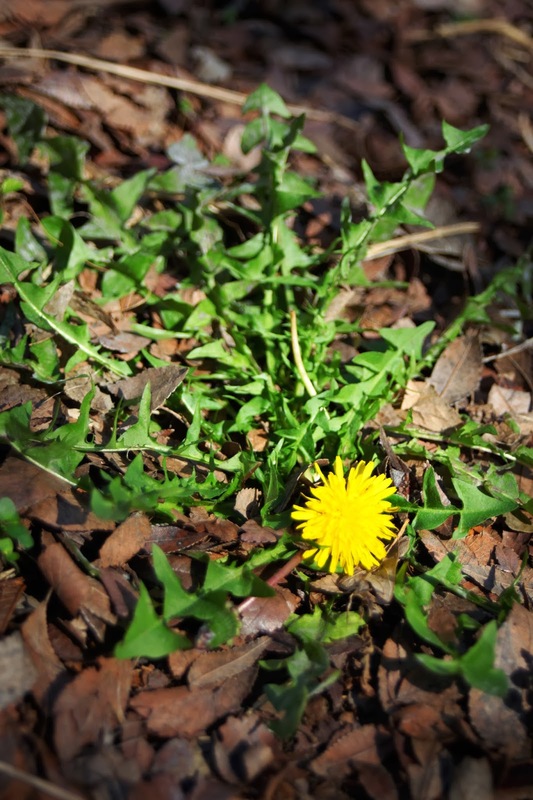 Winter is the best time to eat dandelion greens here in Central Texas. They tend to be slightly less bitter in the colder months and are great additions to stews, soups or rice dishes. We are definitely living in the age of raw greens and juicing and dandelions are plentiful enough to add to your smoothies and meals everyday. But remember that many of our wild edible greens were traditionally cooked, and that can help remove some of the bitterness to make them more palatable. Either way, dandelions are packed with essential vitamins and minerals and can easily become a part of your daily diet. Remember too that wild greens are nutrient-dense; you can eat (or drink!) less than cultivated greens and get the same benefits! 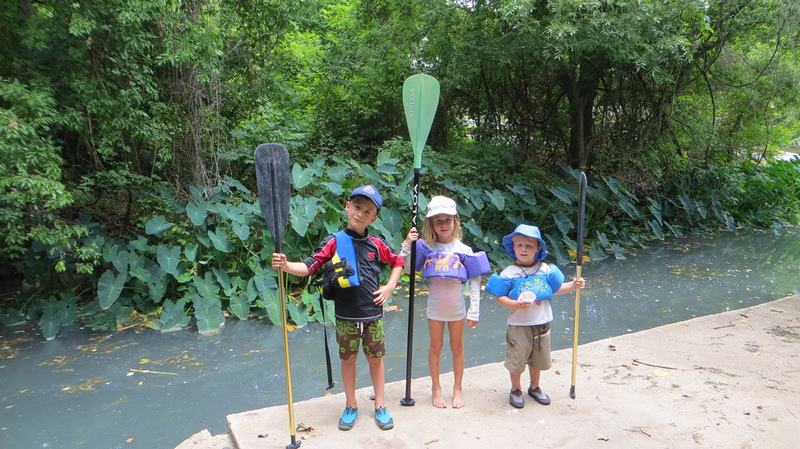 After a long paddle down the San Marcos River and only a few yellow jacket stings to deter us, we were happy with our elderberry harvest... oh, and a day on the river was nice too! It was easy to harvest the umbels from our canoe. Most of them were found dangling over the water on the streambanks.